From accounts to EPOS EKM is integrated with all your favourite 3rd party systems. 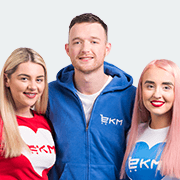 EKM works with a selection of popular 3rd party systems covering accounts, fulfilment and multichannel stock control (eBay/Amazon) - to make life easier if you decide you want to link your online shop into back office systems. Comes with a 15-day free trial. ChannelGrabber offers the ultimate in online multi-channel ecommerce management. It provides simplified selling by syncing stock levels between your online shop and other channels such as eBay, Amazon and Play.com. Exclusive to all EKM customers, ChannelGrabber are offering 50% off the setup fee when you quote "EKM". Start your multi channel strategy today and save money! Get Started today. Using ChannelGrabber with your online shop is ideal if you're looking to maximise sales by listing products in different places whilst keeping stock levels in check. Text Marketer is one of the UK’s biggest and best suppliers of business SMS. With a very user-friendly, easy to use web-based SMS system it comes jam packed with a variety of free tools and features to get your mobile messaging started. With Tier 1 connections and extremely low prices, Text Marketer supply a service that is second to none with incredible value. Skuuudle ‘Lite’ is an exclusive for EKM.com customers and prices start from as little as £14.99 per month.